My association with the Karoo, and specifically Richmond, began thirty five years ago and for a long time was memorable for all the wrong reasons. I was hitchhiking from Cape Town to Natal, mid-winter, and found myself sleeping the night in the back of a parked, (thankfully enclosed) truck on mounds of potatoes. My cold and un-Sealy discomfort was not as rough however as the two kids that died of exposure that night in the dorp. Thereafter, and to my eternal shame, the Karoo was an area to be driven through as fast as possible and preferably with a six pack of Amstel on the passenger seat. Can you believe we used to do that? Almost a thousand kilometres from where I live now in Howick KZN, Richmond still lies slumbering in that great expanse of Big Sky. Dating back to the 1840’s, it’s big enough to have a church and a bottle store, a number of little businesses, and a community that is vibrant, proud and clinging to the hope that it will not be forgotten in the helter-skelter rush of the 21st century. A lot of it is impoverished but somehow it all kind of goes together. Some quaint buildings remain – others trashed for the value of the materials, the yellow-wood floors and doors etc. which are of greater worth than the whole. The odd recent construction has gone up but who wants to break their frantic stride on the NI scurrying to or from their holiday to see a face-brick building? But then it changed. A few years ago entrepreneurs Darryl David (also founder of the Midlands Literary Festival amongst others) and Canadian Peter Baker initiated the first steps in creating South Africa’s first “Booktown” – a Pandora’s Box of old, dusty, rare, and collectable books – all stashed neatly in old, collectable buildings in Richmond. More recently, in another attempt to keep this town alive, give it more appeal, and to entice the holiday rush off the N1 to tarry in the town, Darryl was intrigued to read an article about Chemainus in Canada and how the acquisition of its tag “Mural Town” prevented it from dying and turned it into a multi million dollar tourist attraction. 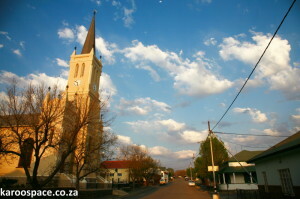 This is a story in its own right, but essentially it was “discovered” by Engela Duvenage, a freelance journalist and head of the Media Liaison section of Stellenbosch University’s Science faculty, who with her husband Louis and his cousin Riana Terreblanche, visited Canada and came upon this town and its amazing success story. Engela wrote about that experience some years later in the Afrikaans press, and suggested it might be possible for this achievement to happen to a deserving town in this country. And so Darryl read the article and went to Holland, Canada and elsewhere to research this concept. Enter the artist: In 2010 Darryl approached me here in Howick, explained what he had in mind, and asked me if I would like to go to Richmond in October 2011 and paint a “derelict” tractor on the wall of a building there. 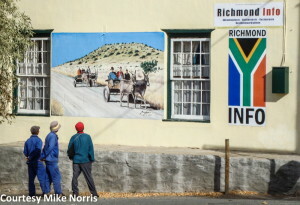 This was, at Darryl’s request, to be named “Moeggeploeg” and together with a neighbouring portrait of “Oom Schalk Lourens” done by a colleague of mine from KZN, were the first two murals in Richmond. My wife Maryanne who loves the Karoo as much as I do was invaluable on these trips, apart from providing ongoing sustenance in the form of hot soup, but also standing on the other side of the street telling me where I was going wrong, and taking delight in the occasion of my being compelled to listen to her! 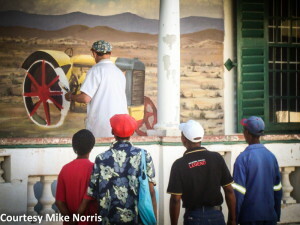 The times I subsequently spent there and in the surrounding area allowed the Karoo and its wonderful people to get under my skin and into my heart. As I said, I am deeply ashamed that my early impressions of what has become my heartland were not as favourable as they are today. 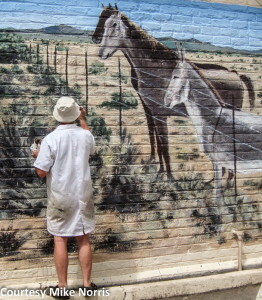 I have painted (smaller than murals!) for a number of years now and I have always leaned to “open space” pictures – with the exception of the odd vintage tractor! 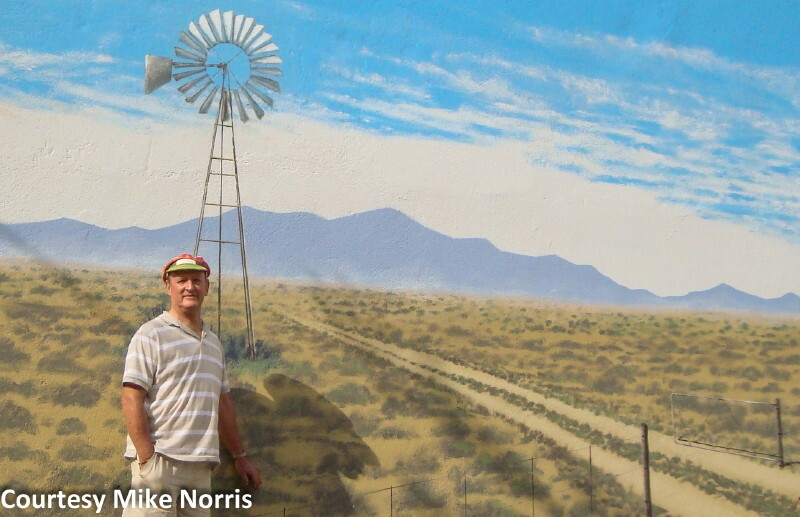 What attracts me to the Karoo is the open, clean, honest space – vast tracts of it. It is a no-nonsense landscape. As a child I gazed out to sea yearning to be where the horizon was – to find later when I got there that it had moved further. The Karoo is the same – when you reach the horizon, there’s another one. 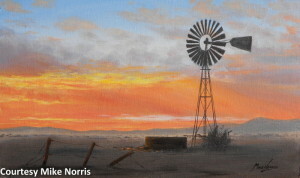 And the people of the Karoo – they live with the environment, in harmony with it. Not in it! They are as much part of it as the profound silence of this great land where you can hear the sand blow and a tortoise sneeze. I have been blessed in a small way by being accepted into their environment. Sadly for me, my time as a mural artist in Richmond came to an end in October 2012 when I injured my shoulder, but I hope that what I have done there at least adds a bit of colour to the town and to some of the people there. I hope other artists continue Darryl’s vision for the town, because not only is it starting to attract visitors but, and just as pleasing, is the fact that so much of the community has embraced this “personalised” art showing that someone is taking an interest in their town. All is not lost and I continue to paint smaller oil paintings on canvas board. 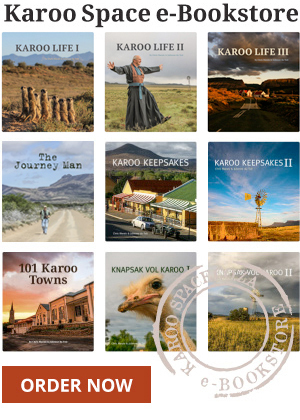 In that way I can still “travel” to “my Karoo”, and as often as I like – and I can even have a six pack next to me on the way!